Figure 1: Fixture the circuit board flat and square on the base of the milling machine using tooling holes for alignment. It's not unusual for circuit boards that have been fabricated to require additional milling to reduce that thickness on certain areas of the circuit board. This milling is nominally completed by the circuit board fabricator prior to board assembly. Usually, this milling is done to allow the installation of face-plates, bezels, or the insertion of the circuit board into a card slot without restriction. Occasionally, the milling operation is either missed, or not milled to the desired thickness. We have often been asked to perform the milling operation on assembled circuit boards. 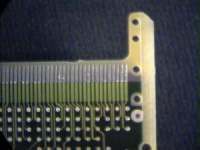 A leading telecommunications company received a shipment of circuit boards that were outside of the specified thickness tolerance (too thick) along the outer edges of the circuit board. Unfortunately, the out of spec condition was not detected until the circuit boards were through the majority of the assembly process, which increased the level of difficulty involved in correcting the condition. The following process steps outline the procedure required to correct this condition. Figure 2: Before photo shows edge prior to milling. Review the FAB drawing to determine the thickness specification and tolerance of the area requiring milling. Fixture the circuit board flat and square using tooling holes for alignment. 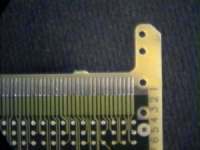 Stainless steel bars can be used to support the circuit board. It is important to provide support below the entire length of the area to be milled. The circuit board must be clamped tightly to avoid any movement during the milling operation. (See Figure 1). Set the depth control and X, Y coordinates to meet the desired thickness and milling location. Set the milling speed on the machine. Select an end mill that matches or exceeds the width of the desired cut. Figure 3: After photo shows edge after thickness has been reduced by milling. Prepare the circuit board, and mask off areas that must be kept free of fibers from the milling process. Complete the milling process, running the cutter at a steady pace. Verify the milled thickness along the entire area to ensure that the desired thickness and dimensions are achieved. Thoroughly clean the circuit board to remove any fibers from the milling operation. Inspect the board under minimum 5X magnification to ensure conformance. Although this repair process may not be as complex as some others, it is important to work from a level surface. It also requires a precision-milling machine in an ESD-safe environment with high-magnification viewing for inspection. Of course, it also requires a seasoned and skilled operator.